I had the opportunity to visit Cathay Pacific’s newest First Class Lounge, the Pier, which recently opened at Hong Kong International Airport. 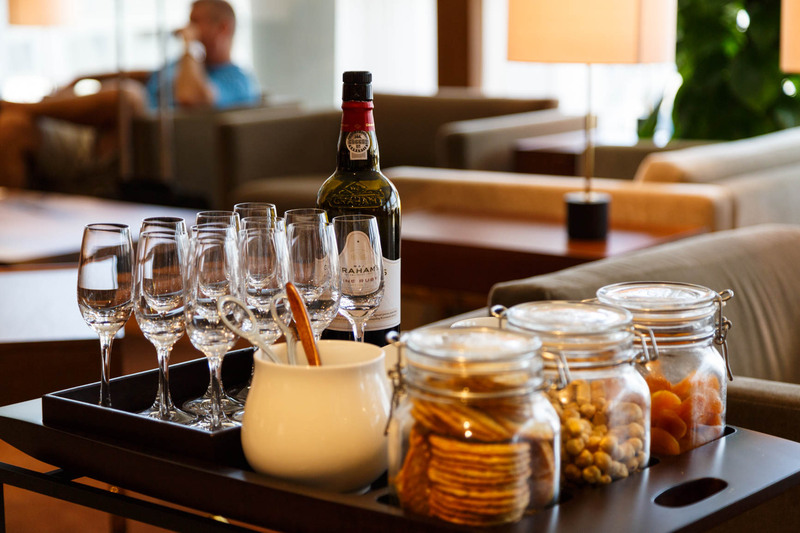 Like Cathay’s other First Class lounge, the Wing, the Pier offers travelers all the luxurious comforts they have come to expect from Cathay: from an exceptional dining experience to relaxation suites, all with world class hospitality. It’s located near Gate 63, which is about a 15 minute walk away from the immigration. Since my flight to Singapore was out of Gate 67, I couldn’t pass up the chance to check out the new lounge. I’ll admit it. I love new lounge smell. The lounge was thoughtfully redesigned to make you feel relaxed and forget that you’re in an airport but rather a hotel. 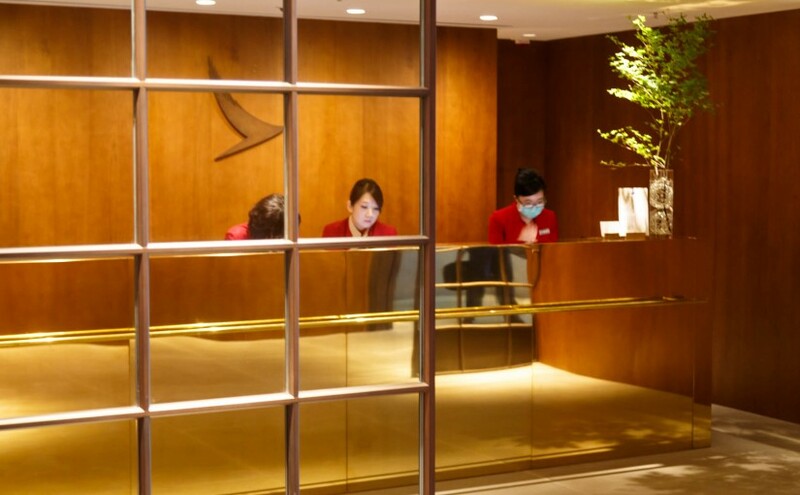 Like all things Cathay, service is paramount. The staff were always there to serve you from the moment you enter, to the day suites, to the dining experience, etc. It’s impeccable. There are a lot of natural elements, use of wood and stone in the tables and the walls. The extensive use of brass in the lobby and in the showers gives a touch of the “ritzy hotel” feeling. 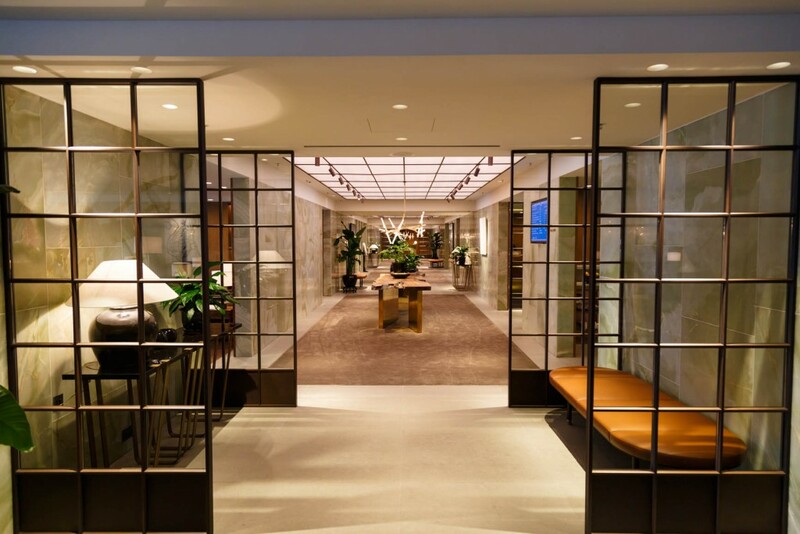 The lounge is laid out along a long hallway, which serves as the main artery that connects the bar on one end to the restaurant on the other, with the pantry, showers, day suites, the business center, and restrooms in between. There are plenty of seats and couches in another room running parallel to the main corridor. There are actually two bars, one at one end of the corridor and one in the Dining room. Both have a wide assortment of free-flowing alcohol. There’s also plenty of seating. Atmosphere is very relaxed and open. There are two main food options: the Pantry and the Dining Room. The Pantry has a full fridge of drinks, juices, and yogurts. There’s also a wide selection of finger foods and snacks, comparable to an ordinary lounge, although the quality is much superior. But it doesn’t stop there. 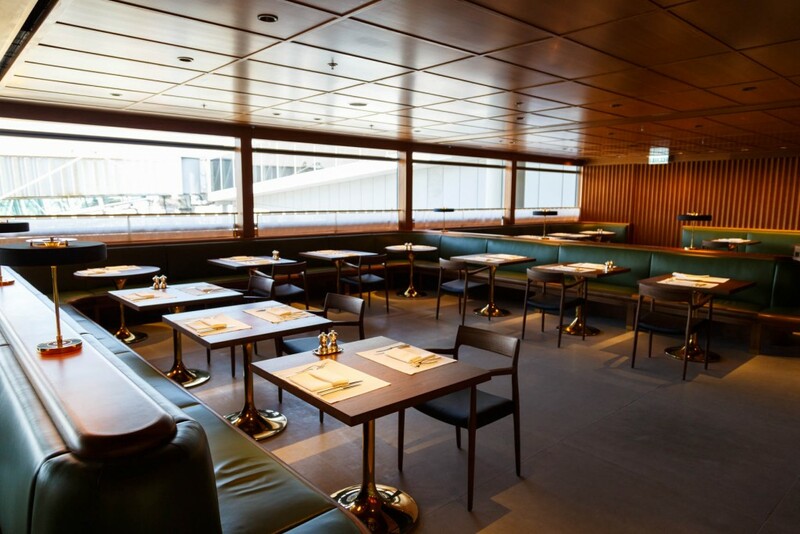 What really sets the Pier apart is the Dining Room. 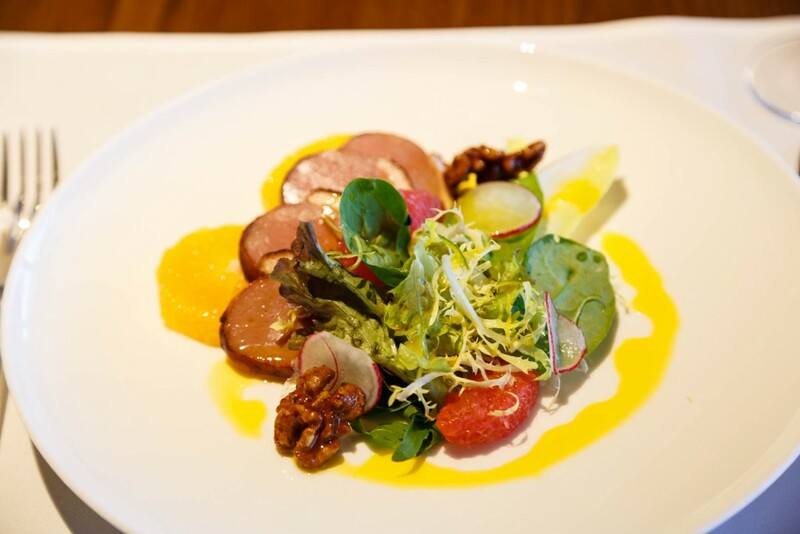 The Dining Room offers guests an extensive à la carte menu, a much wider selection than at the Wing. There are two quarterly-rotated menus a day, one for breakfast and another for lunch/dinner. I like that Cathay chose this route, since it makes them on par with Qantas, which has a similarly extensive menu at their First Class Lounge in Sydney. I ordered the Prawn Salad and the Smoked Duck Breast to start and the Wok fried beef tenderloin for my main. 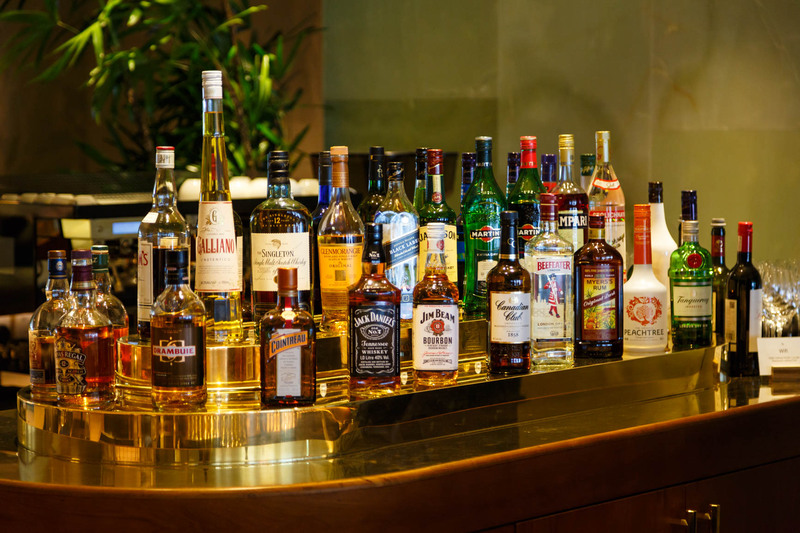 While there’s no Champagne bar, you have a selection of three off the menu. I chose the Moët & Chandon Rosé Brut. Food came out within 5 minutes. Everything was delicious and restaurant quality. I’d say the dishes I ordered were a modern take on classic Cantonese cuisine. There are 14 showers along a long hall way. They are fairly large, having both a rain shower and wand options. A full set of amenities were given, with the care products from Aesop. One thing that struck me was the extensive use of brass/gold plating on the fixtures. Not that it’s bad, but it felt a bit over the top. In case you needed a rest, there are 8 day suites for you to take a nap or just relax. They have a view of the tarmac/gate area and it wasn’t very photogenic, but there are planes that come by. If planespotting isn’t your thing, you can lower the blinds if you’d like. You can access the First Class Lounge at either the Pier or the Wing if you’re flying on a First Class ticket on any oneworld airline or you a oneworld Emerald flying any class on a oneworld airline. The Pier certainly feels less airy and spacious compared to the Wing since it’s downstairs and has a ceiling, whereas the Wing is on the upper floor and is open air. The Wing has Cabanas with bathtubs and day beds, whereas the Pier has separate showers and day suites. The Pier has a full à la carte menu and pantry, whereas the Wing has a partial à la carte menu, a buffet, and a Champagne bar. It’s really a tossup for me. I’ve enjoyed them both and here’s how I’d break it down when deciding. If I’m hungry and have the time, I’d go to the Pier. 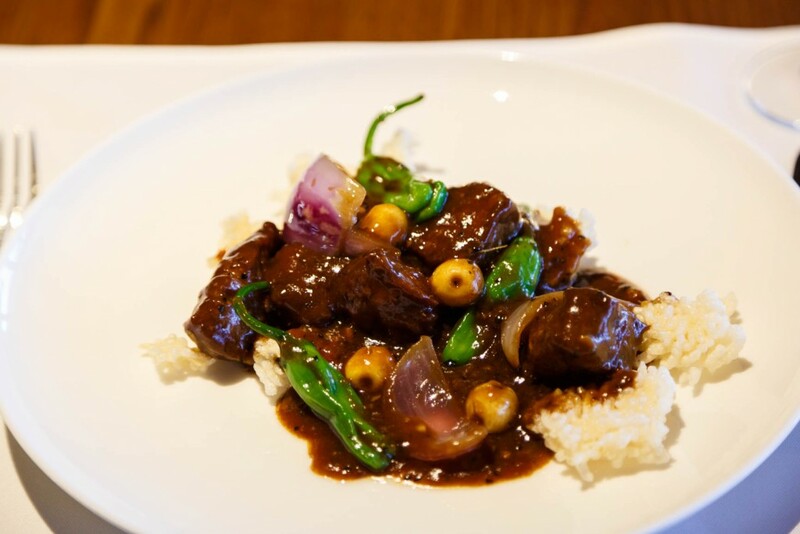 The food is exceptional restaurant quality. If I want to relax and have the time, I’d go to the Wing for its cabana. If I’m short on time, I’d go to which ever is the closest.